In 2006, I spoke to the owner of Warung M. Nasir. 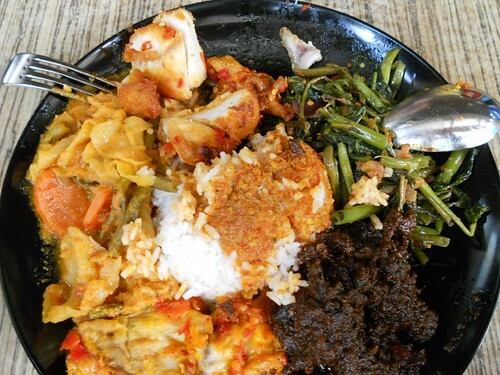 Nasi Padang is a mishmash of different vegetables and meats accompanied by rice. I remembered having it in Indonesia, a takeaway where a paper cone was filled with rice and topped with whatever we wanted: Banana flower curry, Beef Rendang, thick, chewy pieces of Tauhu in black sweet sauces, elegantly fried chicken slathered with minced green chilli and perfect sunny-side up eggs. In the travel time from restaurant to hotel, the juices, gravies and curries had seeped into the rice. When we unwrapped the paper cone, we got an incredible flavourful mess of meats and vegetables amongst fluffy rice grains. Singapore has Nasi Padang as well. Some of which touted good food, like Warung Nasir’s Beef Rendang; some of which are authentic, like Minang House in Lucky Plaza; most of them being more Malaysian than Indonesian. But the best part never changes. 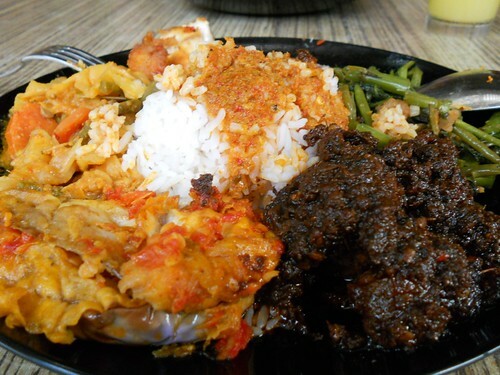 We eat our Nasi Padang all mixed together; rice, gravies and whatever vegetables and meats that we fancied – just like my packet of Indonesian Nasi Padang.